I am so happy to be invited back as part of the DecoArt Mixed Media Design Team for 2018 and I have decorated a Tando Creative tag box for my first sample. 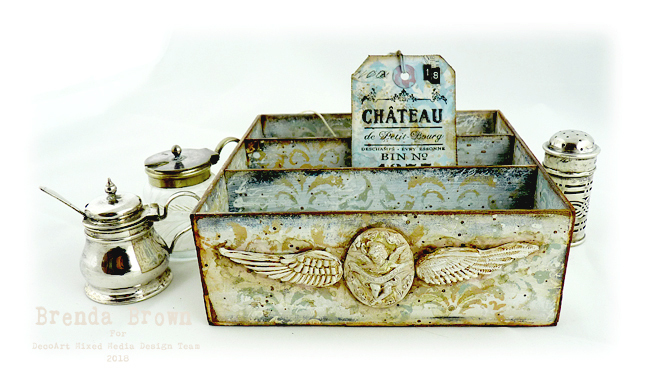 All the details can be see over on the DecoArt Mixed Media Blog. Your box is amazing! It will look fabulous as a storage box. I love the paper. This is absolutely gorgeous! Brenda. Fabulous colours and shabby vintage design. Love that it stores tags - such a great idea . Gorgeous Brenda! I love your layers as always!! Congrats on your next term as well- well deserved you! Your tag box is gorgeous! Easy to see why you are on the design team! I can't wait to see what else you come up with.